St Edmund's RC Church, Beckenham > Sermons > Take Advent Seriously! It has become a bit of a commonplace that clergy moan at this time of year about how Advent, in the way in which the Church has understood it for many centuries, is effectively eclipsed by people’s determination to celebrate in some way or other, Christmas, nearly a month early – in shops the passing of Remembrance Sunday is now the point where this all begins: poppies quickly give way to poinsettias. I will try to avoid this and instead concentrate on the opportunities Advent gives us for deepening our faith as Catholics, and for recognising things in our lives which need his forgiveness. This exercise is something which the Church asks us to go through as a source of real joy and renewal in our lives, not as a drudge. It also needs to be marked by a spirit of penitence about our own community, as Archbishop Peter reflects about in the pastoral letter we are hearing at all Masses this weekend. The Church teaches that the reconciliation we need to find with God, because of the gift of his grace and forgiveness, needs to operate on two levels – the personal and the corporate. We warn against spiritualities which stress one level at the expense of the other. The personal: in Advent, as in Lent, the Church urges us to go to confession and here, as elsewhere, there will be a special opportunity to do this the weekend before Christmas. The beginning of a new Christian year in Advent enables us to take stock of our lives, our relationship with God, our relationships with other people. Where are we going in life? There are some things we may not consider: in his 2015 encyclical Laudato Si’, about the care of creation, Pope Francis urged us to think about how our personal lives and choices impact on the beautiful but damaged world we live in (damaged by us, as he pointed out). So using less heating or air conditioning, using our cars less (and considering the type of car we use), thinking about the sort of lights we use and not leaving them on in a room, not wasting water, recycling and so on: these are moral issues and if we make the wrong choices we commit a sin (in line with this we have recently reviewed and cut down the times when heating is on in the church; there is of course much more we can do as a parish to implement the pope’s teachings). When the encyclical came out Mrs Beirne at our primary school and the staff did some very good work with the children to explain the pope’s teachings, drawing on excellent material produced by our aid organisation CAFOD. More Catholic schools should be doing this. Laudato Si’ is clear that you can’t be a faithful Catholic and a climate change denier: our attitudes are among the things we should consider when we examine our consciences before going to confession. Taking stock in Advent is also about how we look at the world in general. When we examine our consciences we pray for one of the gifts of the Holy Spirit, the gift of the discernment. Discernment is about how we look at things and recognise reality. The message of the prophets which we hear repeatedly in Advent is of the coming reign and kingdom of the Messiah which we see as made real in the birth of Jesus: and that kingdom is marked by justice, reconciliation, peace and right relationships. If we take the Advent prophetic message seriously then we will recommit our-selves each year to what the Church does in the world to witness to justice and peace as part of our moral teachings. At the moment in the world it is clear that we need discernment to recognise the pervasive power of wickedness, the presence of evil, the activity of Satan – ‘Father of sin and prince of darkness’, as the Baptism service describes him, or the ‘father of lies’ – around us. The ugly rise of populist nationalism – here, in the rest of Europe, the United States, Brazil and many other countries – is a direct challenge to Christian teachings in every way; it is all the worse when the people promoting it claim to be Christians or Catholics. These attitudes are made particularly nasty through increasingly negative attitudes towards migrants, refugees and ‘foreigners’. It’s astounding how Christian leaders, apart from the Holy Father, seem often unable to discern the wickedness here, let alone the rest of us. Advent is a good time to be open to how the Holy Spirit is guiding the Church to resist evil, to see through the deceit and falsehood which always accompany evil. Serious stuff, but Advent is a serious time! Fr. Ashley Beck has been Assistant Priest here since October 1996. He is a former Anglican clergyman and is married to Caroline, and they have two daughters, Martha and Iris. He is also Dean of Studies of the Permanent Diaconate formation programme for nine dioceses in southern England and Wales and a lecturer in Pastoral Ministry at St. Mary’s University College, Twickenham. 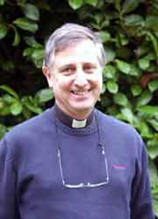 He is the Chaplain to St. Mary’s School. The Parish Office is normally open Monday to Friday from 9.00 a.m. until 1.00 p.m.